One would think that as much as I’ve been into make up these last few years I would have also really gotten into skincare. Afterall, one needs a good canvas to build on, don’t we? Well, the fact is that that logical and obvious truth didn’t really get into my head until recently, and I have just begun trying different ingredients that I had not tried before. Some of those ingredients are cosmetic acids. Many might be familiar with acronyms like AHA and BHA but to me it all looked gibberish for a long time. Finally, I pulled up my sleeves, did some online research and jumped into the pool. The first product that I tried was the limited edition Kiko Intense Peel (currently on sale at aprox 10€). This product is presented as individual wipes wraped in foil. Each packet contains one exfoliating wipe soaked in glycolic, mandelic, citric, malic, lactic and salycilic acids while the second wipe is soaked in some kind of solution that is suposed to “stop the action of the AHAs and BHAs” and “calm” the skin. The recommended use of this product is to wipe your face with the first wipe, let is soak for two minutes and wipe your face with the second wipe. There are fifteen packets in the box as this is supposed to be a two-week treatment. What I observed after using this was that my skin was definitely more even in tone and texture. I also really liked how easy the application of the product was and the fact that you can even carry them on a trip. However, despite its name, I would not catalog this product as an “intense” peeling. The second product that I tried was La Roche-Posay’s Pigment Control Serum (aprox 30€).This is a glycolic acid based serum that is meant to unify the tone of the skin. It is aimed at skins with discolourations or dark spots. After the first use of this product I was blown away. The effect was quite evident and although I am reluctant to use such a product on a daily basis, I have incorporated it as a weekly addition to my routine. The product comes in an airtight glass bottle that also prevents light from degrading the formula, and a glass droper is also included as a way of dispensing the liquid. The serum is a slightly dense liquid that is very quickly absorbed by the skin, so the application should be quick. This is ideal for a product typically applied at night, as it does not leave an uncomfortable sticky feeling. In this case, the product is imbibed in the interior of some sort of plastic socks that you wear for 90 minutes before taking them away and rinsing your feet. 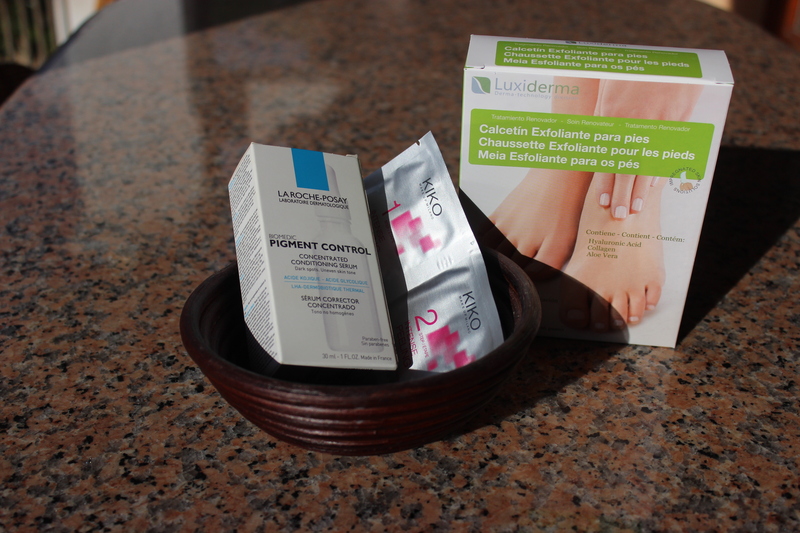 After a couple days, the outer layer of your feet starts to peel, leaving the softer and smoother inner layer exposed. Although effective, I must say that the aspect of my feet right now is quite gross, so I would avoid this kind of treatment during the summer when your feet are most exposed. While the box of this product advertises that it contains hyaluronic acid, aloe ver and collagen, the truth is that if you check the ingredient list you will soon spot the ingredients responsible for the exfoliating effect: glycolic, lactic and salycilic acids. All in all, I am very happy with my first steps into the cosmetic acids world and their great benefits for the skin. Awesome post, this is so helpful. I use a 2% BHA exfoliating lotion to peel my skin. I used to use physical scrubs with microbeads to peel my skin but I feel that BHA lotions are a lot more gentle on the skin and more effective. Have you used it for long? What effects have you seen? I’ve been using it since May last year and I’m hooked 😉 Says it all, eh? AHAs and BHAs for sure work wonders! My skin doesn’t systematically like all (or basically, most) products that contain AHAs, but I use La Roche-Posay Effaclar K and Duo when I have hormonal breakouts! I’ve also tried these Japanese foot peel which is basically AHA liquid in plastic bags. You put them on, wait an hour or so, and rinse them off. After a few days, your feet would start to peel and become UBER smooth! I will be on the look out for those La Roche-Posay products you mention the next time I visit the Chemist’s. And yeah, those are the type of “socks” that I used on my feet. I hope they finish peeling soon as they aspect right now leaves much to be desired!